When spring arrives crawfish boils are a favorite pass-time for people in Louisiana. As soon as the weather permits, the seafood feast begins. The only problem this creates is how to get the smell and spices off your hands once you're finished peeling. There are many old wives tales for cleaning smelly hands after peeling seafood at a crawfish, crab or shrimp boil. We will try anything: lemon wedges, crushed crackers, tomato juice or toothpaste! Now we have a new option that really WORKS! Crawfish boil soap is a premium liquid hand soap that incorporates finely grated pumice stone and peppermint oil. This soap not only cleans your hands, but soothes irritated crawfish peeling hands. It works well for crab or shrimp boils as well. The original Crawfish Boil Hand Soap is created in Shreveport, Louisiana by a company that specializes in handmade cosmetics and gourmet spa products. This liquid soap gets stinky crawfish and spicy seasonings off your hands and much more! This product actually removes dirt, odors, grease (you name it) and is gentle enough to use every time you wash your hands. It's also highly concentrated, so a little goes a long way. Keep a bottle in your kitchen for onion and garlic hands, in your workshop for greasy hands, and one by the water hose for when you clean your catch! Looking for a unique gift for the crawfish boil host/hostess? Bring Crawfish boil Hand Soap and their guests will love you for it! 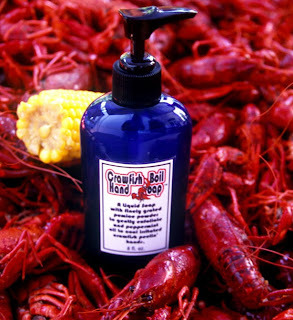 To purchase Crawfish Boil Hand soap, click here!